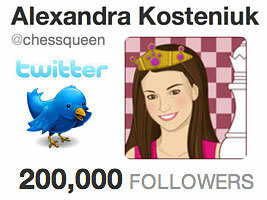 Today my English Twitter account @chessqueen reached 200,000 followers! I’ve been tweeting for 3 years and two months now (see my 3rd birthday post) and been enjoying it very much, I have written more than 5,000 tweets. It’s the easiest way for fans to interact with me and to find out what I’m doing at any moment in time. I have my phone with me almost all the time (except when I’m playing in a chess tournament), and it’s easy and fun for me to send a quick tweet to let everybody know what I’m doing. My next big milestone will be soon when I hope to hit a million views on my YouTube channel “ChessQueen”. I’m at 990,000 views right now. My destiny is to share the love of chess in the world! Hello everyone! 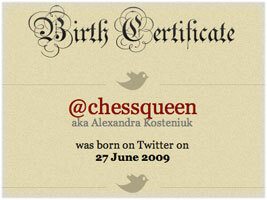 I just found out that exactly 3 years ago I signed up to Twitter under the nickname @ChessQueen. Since then I have tweeted over 5,000 times to close to 180,000 followers around the world. That main twitter account is in English, and I have also opened a Russian Twitter account @Kosteniuk, where I tweet in Russian. 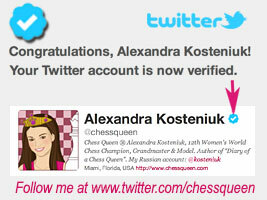 I do post more photos on @Kosteniuk, so be sure to follow both @chessqueen and @kosteniuk. I recommend you follow my chess ventures @ChessKing (for the best affordable chess software), @ChessBlog (the world’s leading chess blog), @ChessPics (for beautiful chess photos) and @ChessKillerTips (for free chess educational videos). 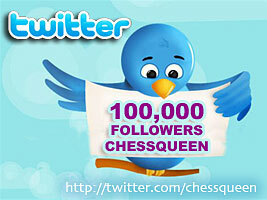 Happy chess tweeting!